Cosmo Recommends: Go On The Ultimate Food Adventure! Explore and enjoy over 12 of the best restaurants at The Fort with your barkada, family, or your guy! Everyone will go home with a happy tummy. It's a foodie's paradise: enjoy a 12-course meal of varied cuisine from different parts of the world in a fun and unique dining experience you won't soon forget. Head for the Venice Piazza at McKinley Hill, The Fort to enjoy some of the best culinary treats this side of the metro! The Venice Piazza mall opened in 2009, right in the heart of Fort Bonifacio. The beautiful facade of the complex transports you straight to Italy, with its vast collection of dining spots that lend an exciting global flair. With so many options available, it's nearly impossible to choose just one place to dine. The solution? Try 'em all! From now until July 30, the Venice Piazza is hosting a series of food events that allow you to sample dishes from their restaurants at an affordable price. Kick off your mouth-watering journey by purchasing a passport at the McKinley Hill booth or one of the 12 participating restaurants. Trust us, the P550 it will cost you is super sulit, with all the good eats in generous portions that you'll be receiving. Follow the guide in the passport to see what meals you are entitled to and start restaurant-hopping! Start with a sweet and fresh Crab and Mango Salad at Blackwood Bistro before digging into a juicy slab of Beef Ribs Adobado at Kuse. Or maybe try some Fried Spring Rolls at Pho'Hoa, followed by a delectable plate of Butter Ginger Crab Claws at The Red Crab Alimango House. Then get a platter of Minced Chicken with Lettuce Cups or Vietnamese Spring Rolls still at Little Asia and a plate of Karaage and Kakuni Buns at Ramen Bar. If you're craving something Western, get the yummy Baked Macaroni with Orange Summer Salad at Empire Deli & Restaurant, paired with the truly filling and satisfying (not to mention spicy!) Quesadillas and Buffalo Wings at Sweet Pea. Then try the Baked Oysters at Pinchos Restaurant and Bar and a plate of Salmon Carpaccio at Old Vine Grille. For dessert options, you have two cool places to try: Sol Gelato and YoSwirls by BTIC. Choose from their tempting flavors of gelato and frozen yogurt to cap off your meal. 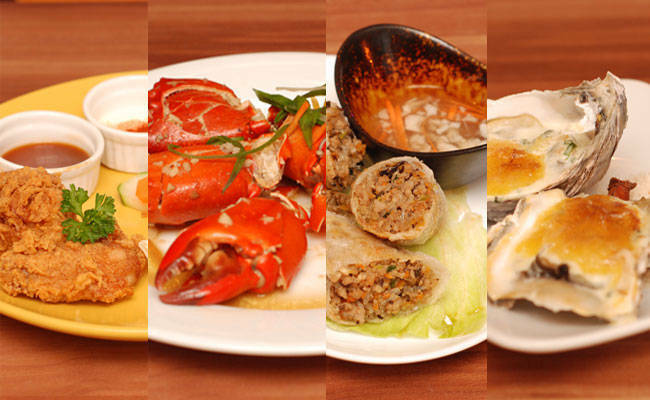 Yes, you can avail of ALL dishes we've just mentioned for P550 (except in Little Asia, where you have to choose one). You and your companion/s are sure to enjoy the experience; you're bound to meet lots of food adventurers like yourself, too! Don't forget to save your passport—it's also your ticket to freebies and discounts from the participating restaurants on any day until July 30! Feeling even more adventurous? Why not try some exotic dishes like deep fried frogs, snails cooked in coconut sauce, eggcheflan, fried crickets, or even giant fried ants? Bring your man and his friends along so they can explore the booths at the Venice Piazza courtyard and live out their own Fear Factor dares! 3. "Food Adventure Chef Cookout"
Redefine your idea of a dampa as you shop at the nearby market for raw meat and fresh veggies that you can hand over to the Red Crab chefs to cook as you please! For all you picky eaters out there, or those on restrictive diets, this custom meal is the best way to ensure your food is cooked fresh, enhanced with healthy ingredients, and prepared in good hands--just the way you like it. Launch the gallery to see some of the food choices that await you at the Venice Piazza Food Adventure! Stop by the Venice Piazza at McKinley Hill to experience these three food events that will change the way you eat! For inquiries, call the Megaworld Concierge at 709-0888 and 0971-8380111 or visit the official website.